The supernova is located 153” NW of the center of NGC 6946. Spectra: Y.-C. Cheng (IANCU) et al. report that spectra obtained on 2017 May 14.7574 UT indicate SN 2017eaw to be an early Type II supernova (ATel #10374). Also, spectra classifying SN 2017eaw as a young Type IIP supernova one week before maximum light were obtained by D. Xiang (Tsinghua University) et al. on 2017 May 14.79 UT (ATel #10376). In addition, L. Tomasella (INAF OAPd) et al. on behalf of the NUTS collaboration report that spectra obtained on May 15.1309 UT confirm the object as a young Type-II supernova (ATel #10377). Charts: Charts with a comparison star sequence for SN 2017eaw may be created using the AAVSO Variable Star Plotter (VSP). Observers may find it helpful to choose the option to print the DSS image of the galaxy in the chart background. Submit observations: Please submit observations to the AAVSO International Database using the name SN 2017eaw. a. Designated PSN J20344424+6011359 when posted to the IAU Central Bureau for Astronomical Telegrams Transient Object Confirmation Page (TOCP) at http://www.cbat.eps.harvard.edu/unconf/tocp.html. Wiggins' discovery details are taken from the TOCP page (posted there by P. Schmeer, Saarbruecken-Bischmisheim, Germany). ATel links are (http://www.astronomerstelegram.org/?read=10372) [and 10373, 10374, 10376, 10377, 10378, 10380]. 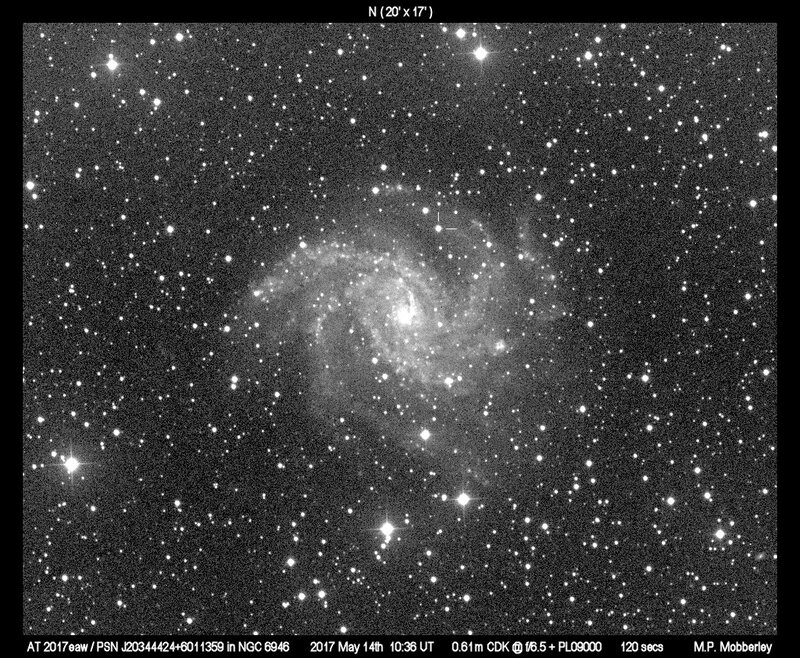 b. Wiggins reports nothing was visible at the supernova's position on his image taken May 12. Optical confirmation was obtained by S. Dong (KIAA-PKU) and K. Stanek (Ohio State) on May 14.4379 UT (ATel #10372). c. R. Khan (University of Washington) reports probable progenitor candidate present at RA 20:34:44.29, Dec +60:11:36.02 in the catalog of mid-IR sources in nearby galaxies published in Khan 2017 (ApJ S, 228, 5). The cataloged object is at <0.76" from the reported location of the transient (ATel #10373). S. Van Dyk (Caltech/IPAC) et al., using HST ACS/WFC archival data, report the probable progenitor to be a red supergiant located approximately 6.4 WFC pixels (about 0.3 arcsec) to the southwest of the discovery position (ATel #10378). d. A. Kong (NTHU; Oxford) and K. Li (Michigan State) report that Chandra archival X-ray data (2001-2012) show no X-ray emission correlated with the supernova position; Swift TOO observations from May 14 (two observations ~8 hours apart) show X-ray emission present and increasing (ATel #10380). e. Xiang et al. (ATel #10376) report SN 2017eaw is the tenth supernova discovered in NGC 6946, to date the most prolific supernova-producing galaxy. Congratulations to Patrick Wiggins on his discovery!